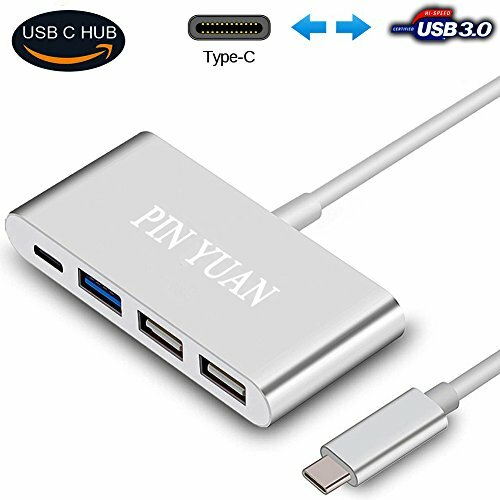 USB-C Hub plug and play,supports hot swap,No extra driver software is required, and auto driver installation. With slim and portable design, you can easily slip it into your bags. Data Transfer Function Compatible with: MacBook 12", MacBook Pro 13" & 15" with Thunderbolt 3 ports, ChromeBook, Dell, HP, Lenovo, more with Type-C port computers, laptops, tablets and phones. Charging Function Compatible with: MacBook 12", MacBook Pro 13" & 15" with Thunderbolt 3 ports. Super fast data transfer speed:Transfer data at speeds of up to 5 Gbps through USB 3.0 ports. That's fast enough to transfer a full HD movie in just seconds. Sleek & Compact:Aluminum-alloy finish perfectly to meet your life style and easy to take out for business or trips. Tips: If you use an High current drive, such as an extersnal hard drive, you need to connected the power supply to assistant power supply. Guarantee: If there is any question about using method or any problem,please feel free to contact us, we will try our best to help you.